Summer entertaining is easier than you think. If you’re overwhelmed at even the thought of hosting friends and family, choosing a theme may be the perfect thing for you. A theme party takes the guesswork out of entertaining. One of my favorites for summer is a black and white movie night. For everything from what you wear to the food and drinks you serve, simply let the black and white color scheme guide you. 1. Cue up an old black and white movie on your TV. Some classic favorites that are easy to find and fun to watch are Sunset Blvd., Casablanca, All About Eve, A Streetcar Named Desire, or shake it up with Hitchcock’s Psycho. The movie is meant to be the back drop for your party, not the main focus so remember the visual is more important than the audio. 2. 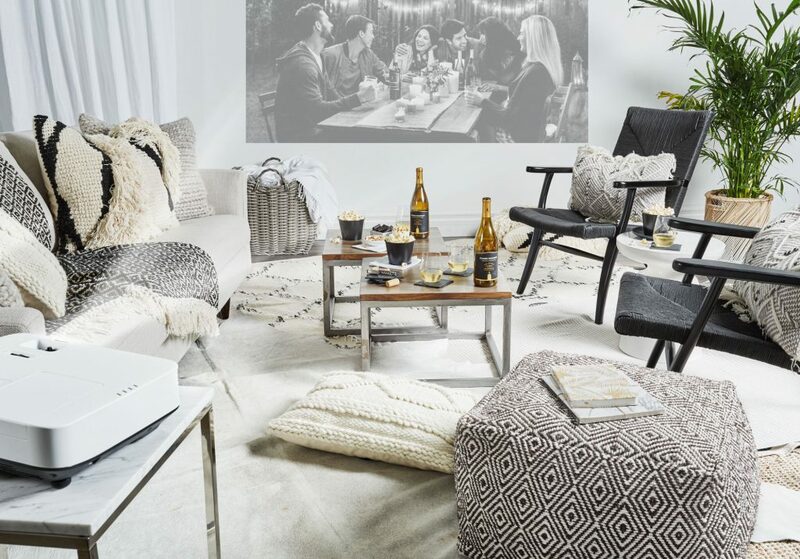 OR take your cues from the pros and use a movie projector to project the black and white movie onto an interior wall, or if entertaining outdoors hang a white sheet to use as your screen and project onto that. 3. Décor is simple with things like black and white napkins, table runners or table cloths. Vases of white flowers next to black and white pillar candles create ambiance in minutes. Add lots of pillows and throws (mix of black and white of course) for sitting on the ground or getting comfortable on the couch. 1. Popcorn is perfect because it’s already white and can be dressed up with fresh herbs, different kinds of salt or infused butter, like truffle butter or sriracha butter. 2. Crostini are also an easy way to stick to the theme! Take sliced baguette, spread with chevre, top with black tapenade, warm in an oven and you have a go-to appetizer. 3. Fill tall water glasses with black licorice and set out bowls of black gum balls or other black colored candies. 4. Use black and white sesame seeds to top store-bought sushi rolls. 5. Offer an on-theme dessert option like black and white cookies. 6. Serve a nice chilled white wine like the new Robert Mondavi Private Selection Bourbon Barrel-Aged Chardonnay, the first ever Chardonnay to blend California winemaking with the Southern tradition of Bourbon Whiskey aging. It works as décor too because the label is black. Invite your guests with a black and white colored e-vite, and encourage all attendees to wear only black and white attire. This can be as formal or casual as you like. And voila your summer is off to a fabulous start. See, summer entertaining is easy. Clink!